A larger batch than I made. Modern travel can be especially unfriendly to ancestral eating strategies that emphasize fresh whole foods. Although airlines try hard, the logistics are tough, and airplane food in general has a poor reputation. Some low- and zero-carbers tell me they just take the opportunity to fast. Even when traveling by train or car, it can be tough to impossible to scavenge much if any "real" food from rest stops and kiosks. Fortunately, it is possible to pack something to bring, but what? Weight and spoilage are concerns for many fresh foods, especially animal foods. So this trip, I am going to borrow from a very old approach to preservation and portability of high-powered food. Yes, this time, I'm going to fly with pemmican. Pemmican is credited as an innovation of native North Americans. After reading and watching as much as I could about food preservation and pemmican's particulars online, I came to think of pemmican less as a specific recipe and more abstractly as a versatile food preservation approach. The strategy hinges on the fact that lean meat and animal fat have very different requirements for long-term preservation. Reflecting this, the lean and the fat are first divided up, after which quite different preservation methods are applied to each. Finally, the results are combined back into a single product. Fully drying lean meat helps prevent bacterial activity, which depends on moisture. Rendering fat on low heat separates the pure fat out of the source tissues, which degrade quickly. The pure fat by itself, once rendered, can last a long time. It mainly needs to be protected from air and light, which promote rancidity. Traditional packaging methods do just this. I chose salmon this time for the lean and beef tallow for the fat, a combination I have not seen, but that sounded good. I also added a few blueberries for flavoring, though this is optional. I started with 625g (22 oz.) of wild-caught salmon, fresh frozen. I thawed it, removed some of the extra water with paper towels, cut it up, and placed it in a food dryer for about 15 hours, turning once early on. 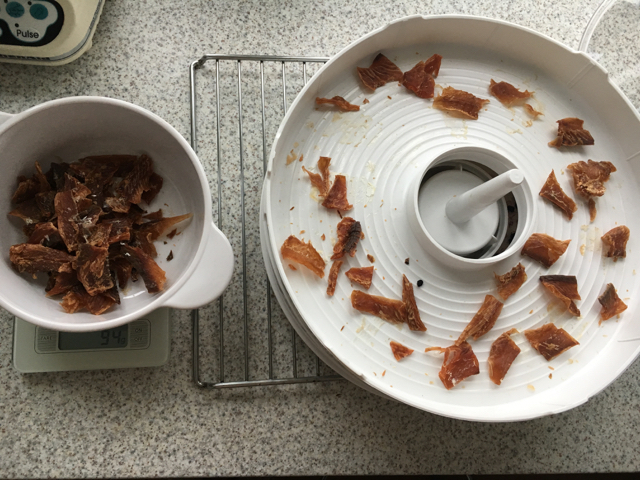 The key point here is that the lean must be completely dry and brittle, far dryer than jerky, which should still have some bend to it. Next, I placed the result in a blender. This time, I blended for longer than I did in my first trial batch awhile back. Sure enough, I got the sought-after "powder" result this time. It took a solid minute or more of blending at different speeds to get there though. A mortar and pestle is traditional for this step. 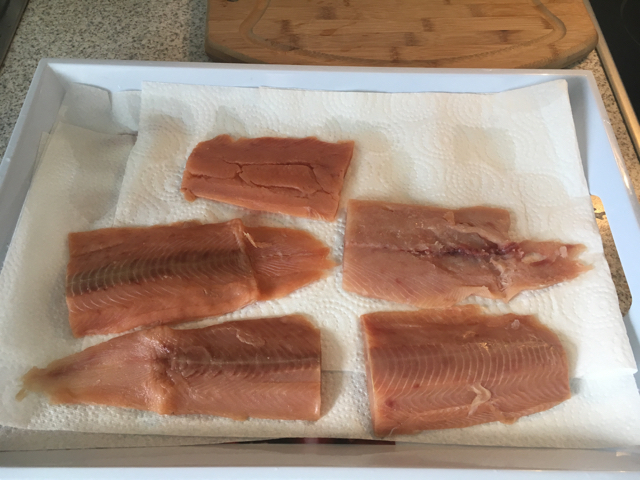 For this page, I followed the same process as with the salmon with about 200g of wild blueberries, which were also fresh frozen. I dried them on another rack right along with the fish and then blended the dried result down to a powder. 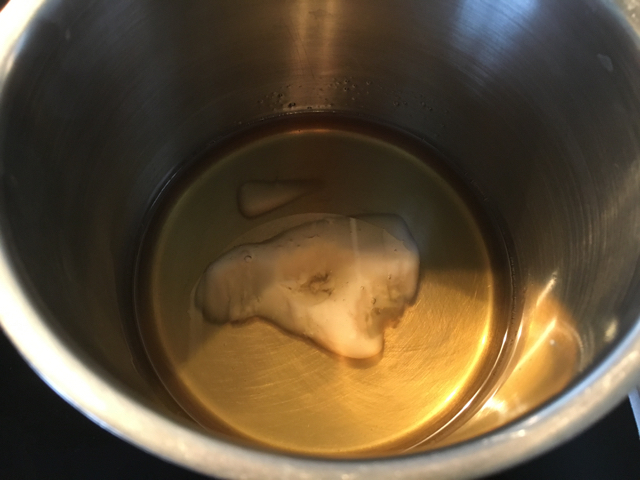 I didn't have to render the fat myself since I was finally able to find a source of beef tallow from a butcher (tallow, once commonplace, has proven hard to find after a half century of relentless, but scientifically baseless, slandering of animal fats). I weighed the powders and then chipped out about an equal weight from my refrigerated tallow supply. I warmed this up on very low heat. The only goal here is to melt it so it can be mixed with the powders. 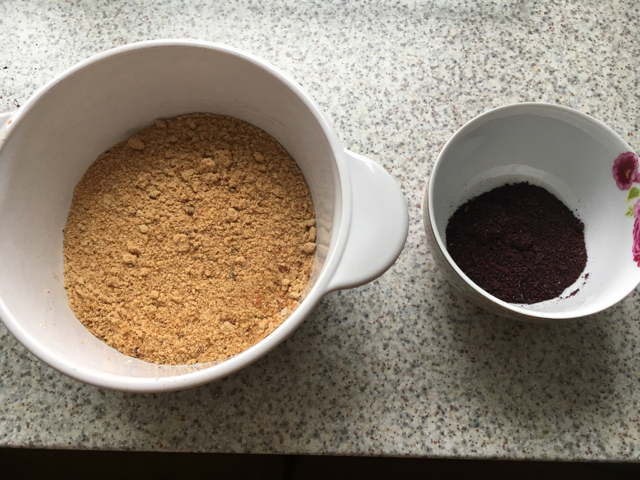 After stirring the dry and liquid ingredients together in a bowl, I spooned the result into two small plastic containers with sealing lids. The point here is to help prevent any oil from escaping and getting tough stains on clothing and luggage (I will also place the containers inside ziplock bags for this reason, just in case). I lined the containers with butcher's paper, filled them up, closed the paper inside, and sealed the lids. The inputs were 625g of salmon, 150g of tallow, and about 200g of blueberries (respectively, 22 oz, 5.3 oz, 7 oz), which totaled about 975g of ingredients. These were reduced with drying to 290g, so about 30% of the original total weight. Great for travel! I ended up with about 130g (4.6 oz) of content in each container, plus another 30g that I sampled right away. So what macronutrients are in those two containers? The estimated macros on all the inputs together (based on the breakdowns on the frozen product boxes) were: 1,940 calories, 126g of protein, 159g of fat, and 12g of carbs (from the berries). So each 130g container includes 873 kcals, 57g of protein, 72g of fat, and about 5g of carbs (rounded). Calories are 228 from protein, 648 from fat, and 20 from carbs. That's 72% of calories from fat. And so: the perfect travel power food, inspired by the old, old, school, along for my next flight. UPDATE: Pro tip. Watch out of the 100ml limit on "liquids and gels" at the security line. I would have never thought of this as a "liquid or gel," but the x-ray machine guy was curious. I said it was my lunch and they let me through. Safest way would be to create sub-100ml (g) packages and put them in the clear plastic bag for the security line. Also, recall that if you are flying internationally, this could not be brought into a country with a quarantine on meats. Eat it before landing (no trouble there! ).